You'll all know by now that I absolutely love dresses! They probably make up 99% of my wardrobe as I find them so easy to throw on and create cute everyday outfits with. But I rarely have the chance to get properly 'dressed up' for formal events, so when I was contacted by the lovely Naomi from Ghost London and offered the chance to review a dress from their gorgeous collection, I felt very privileged! 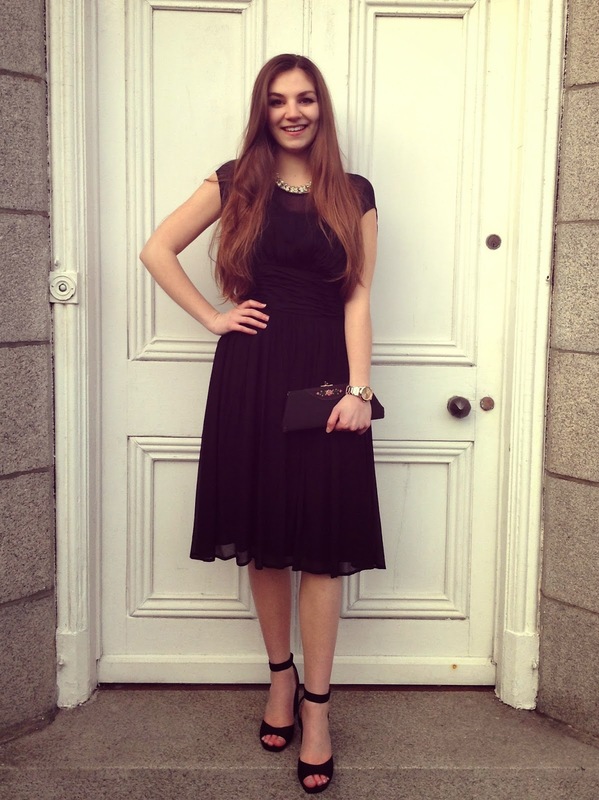 The clothing range instantly appealed to me, with its classic, vintage-inspired pieces and I chose this elegant, simple yet stylish, black 'Hatty' cocktail dress. I know it will last me for many, many years to come and I'm delighted to add it to my ever-growing dress collection - Thank you Ghost! I've worn and loved the Ghost perfume for years but have never been lucky enough to own a piece from their clothing range. Ghost have been producing collections since 1984, specialising in vintage designs made from durable fabrics which are easy to wear and flattering for all shapes. The brand has even gained a seal of approval from the one and only Grace Coddington, who described them as 'clothes that women like to wear'. Couldn't agree more with you Grace! 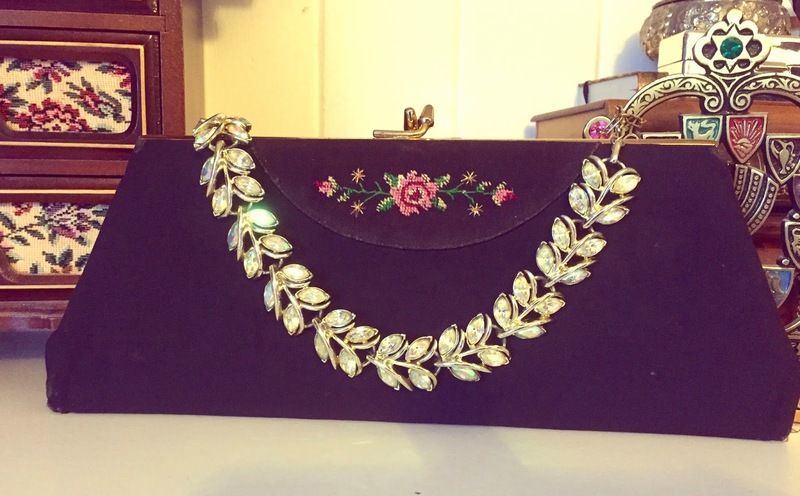 I wanted to keep the overall look simple and chose minimal, vintage accessories: a shiny but subtle statement necklace and a very old embroidered evening clutch. This outfit is a little different from what I normally wear but I wanted to show you this classic number and make you aware of the Ghost clothing brand. I can't recommend them enough if you are looking for an elegant dress for any formal occasion. They also have a wonderful bridal range full of drool-worthy pieces, so with wedding season fast approaching, you know where to go! Have any of you worn Ghost London before? What a lovely dress. You look beautiful in it! The detail on the waist is a nice touch. Such a beautiful dress, and I really love the necklace...it is stunning! I love dresses too and this one here is a beauty! I love the sheer details! What magnificent dress. You look beautiful and sophisticated . You look so adorable! kisses! Have a great weekend!!! I've never worn Ghost London, but the dress is amazing and I really the necklace too! Maybe you wanna follow each other on GFC and bloglovin? let me know, I love your blog! 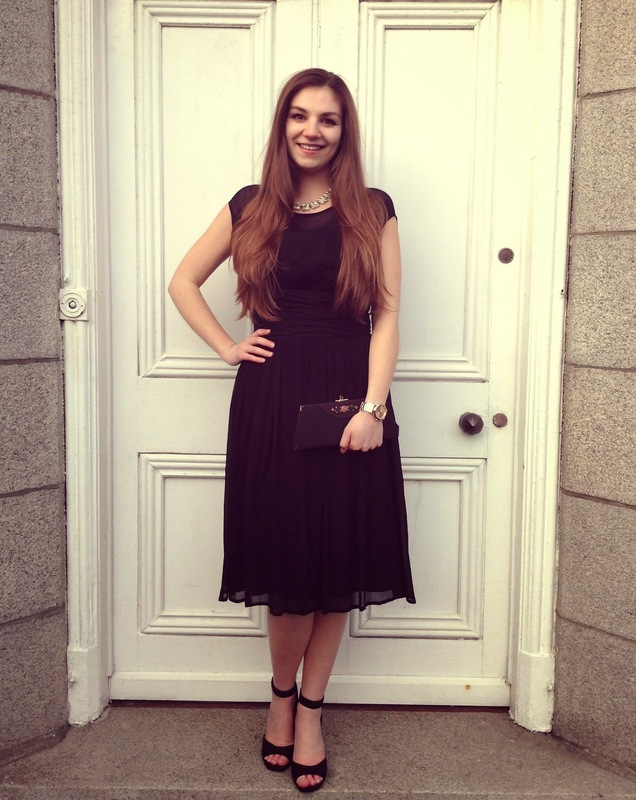 What a chic all black outfit Helen! 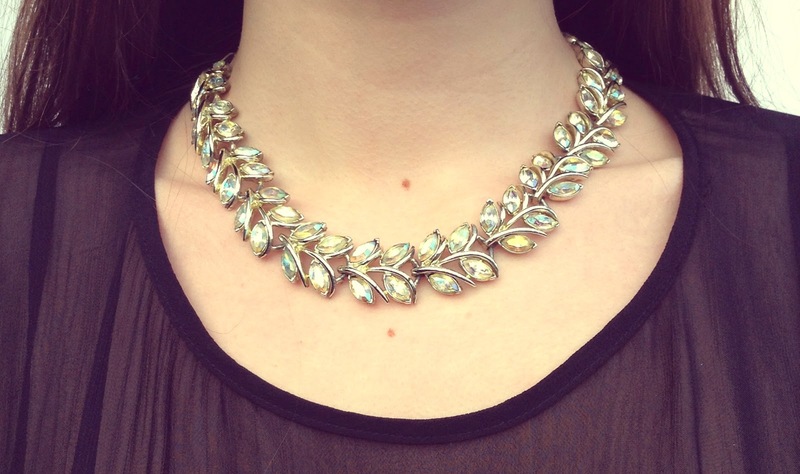 Perfect with that statement necklace! I really love the dress, is really beautiful! That's a lovely dress and it really flatters you! Wish I looked this stunning in a dress! Helen you look so elegant and pretty! Your shoes are delish!! Love these accessories are perfect for these Ghost items. You look fab, so so chic!!! So gorgeous! Such a perfect LBD! So beautiful! I love your heels! amazing necklace - LOVE ! You're beautiful, I like your blog, you think if we continue down GFC ?? Never heard of the brand before! but nevertheless you look beautifull! really classy and timeless. you know I think black is always a good choice ;) great outfit my dear! What a wonderful dress! so elegant and timeless...and you accessorized it so well. that beautiful necklace really complements its elegance in a perfect way. Such a pretty dress and you have the most amazing hair! Gorgeous! I love vintage inspired pieces! wow i love this Outfit, it's on top! The dress is adorable and love how you accessorized it, so cute ! You look pretty and your necklaces look so adorable. Love it. Let me know if you follow me. I will follow you back. I promise it. I love that dress! The mesh is so pretty! That necklace is too! Loving your style and your blog, beautiful! Following you now on GFC! Would you like to check out mine and connect with me? A classy dress like that goes a long way! Love this dress. So classic, you look beautiful. Lovely look, the dress is so nice, loving the length of it! today you're very chic, smart, I love all your look, and this beautiful shoes! Your dress is gorgeous! Love the vintage vibe! looks so pretty with those shoes! I should incorporate more dresses into my wardrobe! Lovely outfit, the necklace is so pretty. Also I love the look of your watch, where's it from? The necklace is so so pretty. Love it. This dress is absolutely gorgeous and you're so lucky to have been offered it to review! Ghost London sounds like a fantastic brand, although I've never heard of it before now. I totally agree, dresses and skirts are my favorite pieces to wear! Never heard of ghost london before but I'll be checking them out now! You look beautiful and the dress fit you so well. I'm so in love with dresses too! Yours is so pretty! Cute this dress, beautiful necklace. Your necklace is beautiful ! The dress is so pretty; perfect for special occasions. You look so elegant and beautiful in this black dress! What a cute dress! You look effortlessly beautiful on the dress. That dress is so beautiful! And this may be completely random, but it looks gorgeous against that white door :) Love your necklace, too! You look stunning! Loving the necklace! Lovely post and images! That dress is so chic. Have an awesome new week! What a lovely look. The necklace looks great. You did right for me to choose this black dress, as it's stylish now but timeless!! Yes to all black. You look stunning babe! This is such a cute dress on you. Such a beautiful necklace! Love the stitching on the purse as well. You look so brilliant! I haven't heard of Ghost before, but I'm so excited to look more into their brand. This dress is gorgeous-it's the perfect blend of classy, but fun and modern. Next time I have a more formal event to go to, I'll check out Ghost for some options! absolutely gorgeous! I can't get enough of those shoes too! This such beautiful look. I love how you can easily style a black number with accessories. Your dress is super chic! You look so pretty in this little black dress and I love your vintage necklace, it's so beautiful! Very nice dress and necklace! So beautiful!!! Love this dress! you look so pretty in that dress ! Love your dress, simple from one side and so elegant from another. I love how it could be dressed up or down depending on the occasion! Stylish and classy! The timeless black dress- always a good idea! Stunning look dear! This dress is beyond gorgeous! You look so lovely! I went on to the Ghost website, and they have some super cute stuff! Black is classic, my love for it will never die!! Thanks for visit, hope to see again!! A perfect little black dress, super feminine and adorable! I love this look! The black dress is perfect. The necklace and the clutch are gorgeous and only add to the beauty of the look! What a classic and sweet look! I love how modest it is and it looks great paired with that clutch! Just discovered your blog and I'm so glad I did! I'm in love with the name! Pretty sure this dress was made for you! It's beautiful and fits you perfectly. 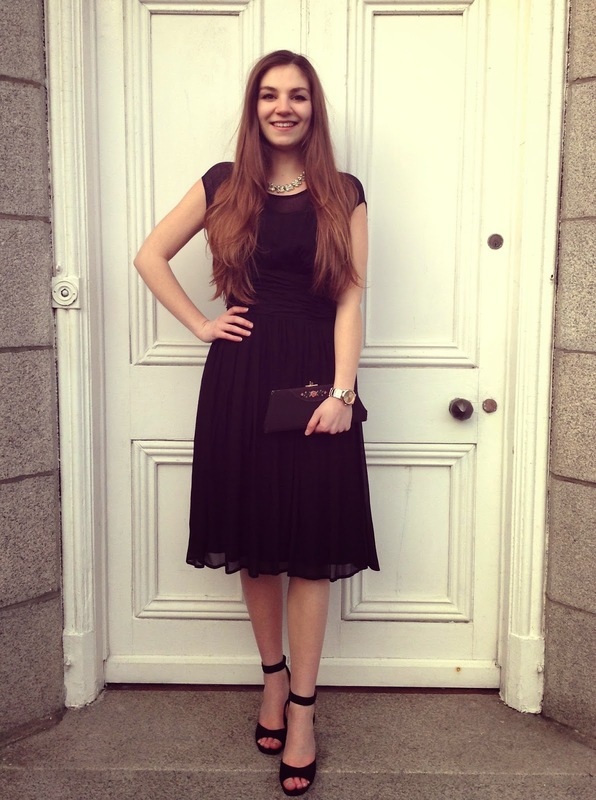 You can't beat a classic LBD! You look gorgeous and the necklace is such an eye catcher! Very beautiful dress. I also love dresses- I think they can be so classy and timeless. This is one of those pieces that will be timeless. I love that necklace as well! Love your neck lace so much! Thanks for stopping by!